Bethany Homes, owned and operated by Hope Mission, hosted a remarkable open house BBQ on Saturday, May 17th. 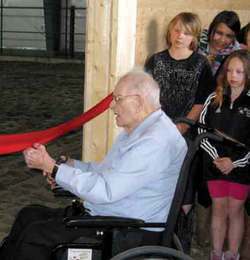 The event was geared to showcase the latest addition to their beautiful facility located just east of Wetaskiwin, a state of the art riding arena, built to help facilitate their award winning ‘Horses of Hope’ program. The program, honed at Hope Mission’s sister facility, ‘Brightwood Ranch’ in Evansburg, Alberta, is designed to help ‘at risk’ youth to develop trust and learn to build healthy relationships with the animals, other people and God. Coupled with the ‘Horses of Hope’ program, the Bethany Homes facility also boasts a fully functional modern greenhouse and large gardens area, which will be incorporated into the program to teach kids about what healthy growth is, and the conditions that are required to achieve it. Ryan Harding, who oversees most of Hope Mission’s programs in the Wetaskiwin area, stated that Bethany Homes will see kids bussed in from, “anywhere” to participate in the program. Starting in June, they will be running day camps for four weeks where kids become a part of the program and hopefully continue to come afterwards and build on the relationships they have formed with the animals and the staff. The ribbon cutting ceremony was performed by Harvey Jespersen, who founded Bethany Homes for Children in the late 1940’s as a home for children whose parents struggled to support them. Harvey was clearly moved by seeing this next step in the organization’s long and highly respected past. The afternoon also held round pen demonstrations of working with horses by Rick Benson of Triple Seven Ranch in Utah, wagon rides, horsemanship demonstrations and live country music by Jeff Gore from Texas and Christine Schauer, Equine Program Facilitator at Bethany Homes. Christine Schauer sees unlimited possibilities for the program, everything from helping heal wounded kids to teaching them math skills by using conversion from hands to centimeters. In speaking only a few minutes with Christine, who is just one of the quality staff preparing for this new chapter in the life of the organization, you are immediately put at ease by her kindness and smile, not to mention the ‘whinny’ of her cell phone ring.